So, you already know the basic technique behind bending strings. But what next? Well, then next step is to bend within a scale to make sure the bent notes you're hitting fit within the piece you're playing. 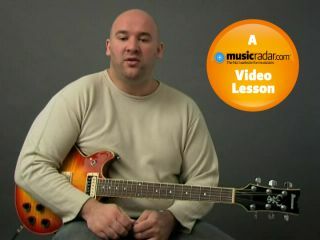 In this video, we're talking about the major scale. You bend up, you bend down… Right? Well, yes, but one of the key parts of string bending is how you release your bend, so sometimes you should only hear the sound of the string as you bend up, and other times you should hear the string ring out as you release the bend too. Obviously, once you've bent a string up in pitch you will need to release it at some point. Here, we notate string bends with 'BU' for bend up and 'BD' for bend down. Where you see BD it's telling you to let the string ring out as you release the bend. If there's no BD, you shouldn't hear the release phase of the bend. Look at the first three notes of Example 2 below. You should bend from F# to G# and back down to F# again in one smooth motion. You should only pick the first note here. This is the scale our track is based on this issue. Practise the scale as it's written here first, then try bending from one note to the next. There are standard 'bend-ups' here, plus some notes you'll need to bend and release. Look for the 'BDs' in the tab to tell you where you should hear the release.